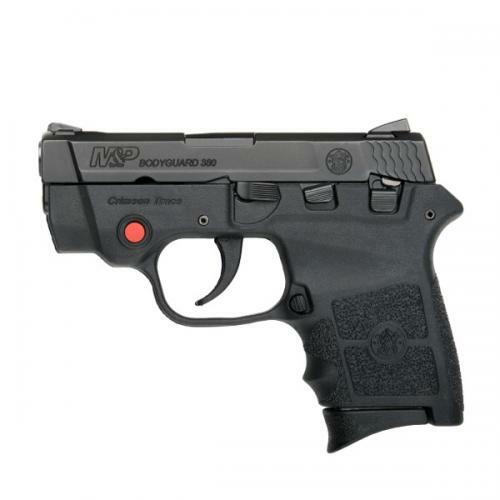 “Compact and sleek, the M&P BODYGUARD 380 delivers personal protection in an easy-to-carry, comfortable platform. Chambered for .380 ACP, the lightweight pistol features a high-strength polymer frame with a black, matte-coated stainless-steel slide and barrel. The new M&P BODYGUARD 380 retains original design features including a 2 ¾-inch barrel, which contributes to an overall length of 5 ¼ inches and an unloaded weight of only 12.3 ounces making it perfectly suited for concealed carry. Lightweight, simple to use and featuring integrated laser sights – nothing protects like a BODYGUARD.